Today in this post I will tell you how you can fill out any PDF forms online. If you get forms in PDF to fill and it don’t have box where you can type content as you get in an online form in a webpage, so what you do, use Acrobat Reader or some other PDF editor to fill those forms? There is a batter solution for it that also without installing or downloading any software. 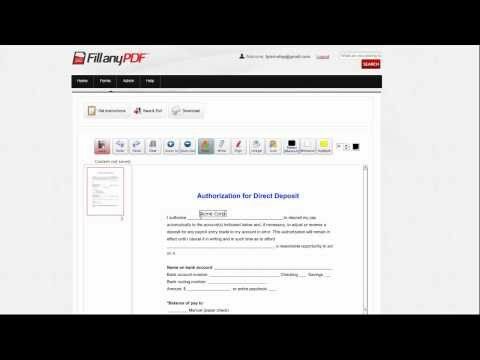 FillAnyPDF lets you simple fill out any PDF forms online. Even if that form have box to fill it. You just upload or give the link of that PDF form and then it will let you type anywhere in that PDF. You will able to change font size and color, highlight any portion of PDF and give drawing/digital signature to it. After you completed, you can save and download it to your computer or if you have an account (it free) then you can share it directly from there. You can also invite peoples to fill out your blank form and track the results without forcing them to download, print, scan or fax.